So, apparently this was a tie-in with Takara’s Jenny toy line. The story is, Jenny’s on her way to the theater to practice for an upcoming role. Her script gets stolen though and has to track the pages down in different stages which are entered through the hub world. Once you collect a key and memorize letters and numbers, you go to the theater and use them to unlock the combination lock. Jenny has 2 abilities: punching and kicking, and after picking up powerups, throwing stars and bug spray of some sort. At the end of each stage, you go into a dungeon and fight skeletal dragons to play slots with a hooded person named Whomanchun. 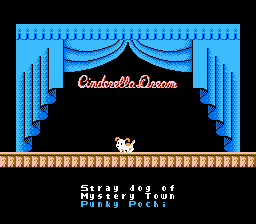 It’s a pretty bad game, though nowhere near kusoge territory. The difficulty of this game is pretty hard to be honest. 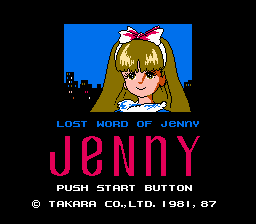 This is an English translation of Lost Word of Jenny: The Lost Message for the NES! 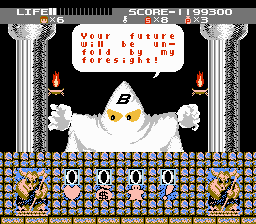 Only the fonts were changed in the game, so no modified graphics this time from Zynk!